In the mid-18th century, Gaelic was by no means spoken by the majority of the Scottish population. Its decline is believed to have begun during the reign of Malcolm III of Scotland (1058-1093), who broke with tradition by giving his sons Anglo-Saxon names. Norman French became favoured by the royals and aristocrats, whereas speaking Ingles, later known as Scots, became increasingly common among those outside of the court. By the 1300s, Scots was the dominant language in both written law and literature. The Bruce, a patriotic poem written in around 1375, was notably written in Scots, not Gaelic, which reflects the shift that had occurred. By 1755, approximately 23% of the Scottish population spoke Gaelic. Of the 23%, many of them lived in the Highlands and Islands; it had always held great importance to the clans, but repeated blows, such as the loss at Culloden, and the subsequent Highland Clearances, diminished its use more and more as the years passed. Last autumn, Catriona, Culloden’s Head Education Guide, designed a resource pack for the schools that visit throughout the year. In it she included biographies, family trees, timelines and explanations of commonly used terms. She decided to write it as a dual-language booklet, so that the person can read it in English or turn to the back for the Gaelic. This has proved popular with those who have seen it, as there is the opportunity to attempt to read it in Gaelic, whilst knowing the meaning in English. The prefix Mac- means son in Gaelic, so Macdonald means son of Donald and so on. Duff is derived from the Gaelic dubh, which means dark. Buchanan comes from a Scottish place name that means house of the canon. Cameron means crooked nose (Gaelic: cam – crooked / sròn – nose). Murray is derived from the Scottish region Moray and means seaboard settlement in Gaelic. We hope you enjoyed this little insight into Scottish Gaelic. As always please share, tweet, like and comment. 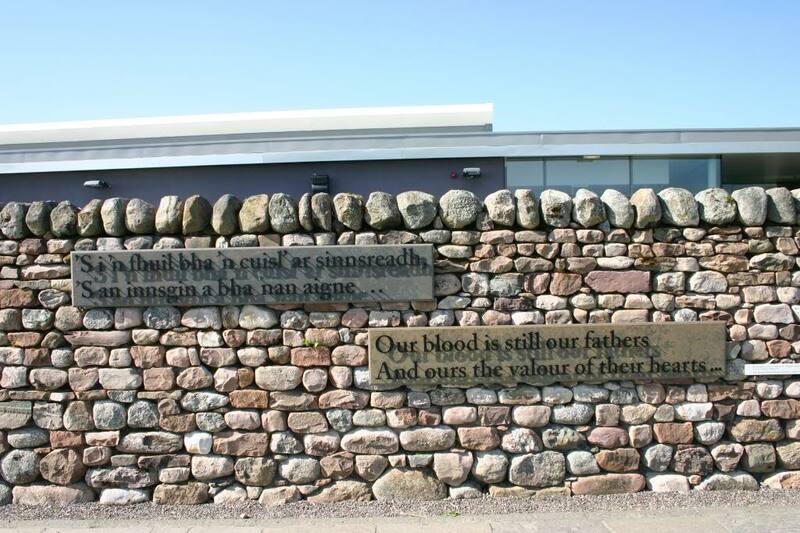 The great thing about working at Culloden Battlefield is discovering all the different connections people and places have to the site as it’s influence and story reaches across many different and unexpected places. Today we’ve picked two little gems from a couple of properties nearby that show different aspects of the Culloden story. 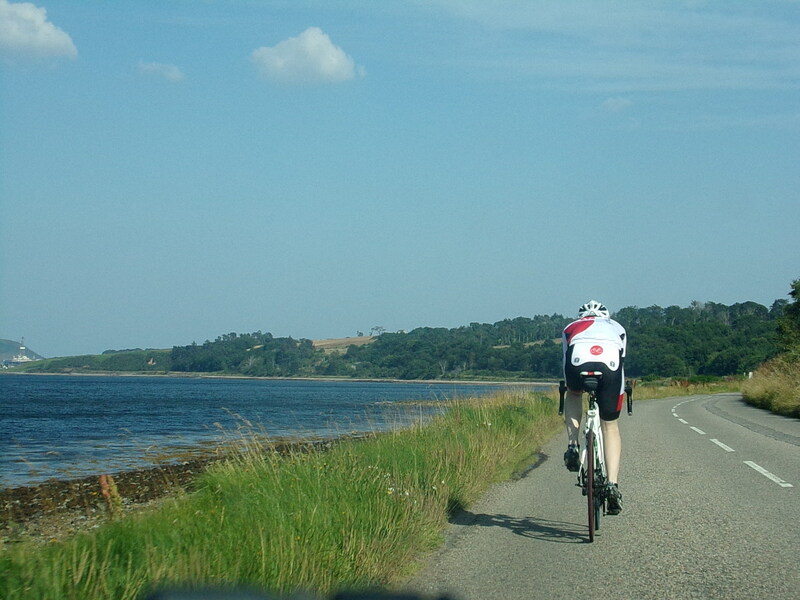 Firstly to Hugh Millers Birthplace just across the water on the Black Isle. Hugh Miller was a well known geologist in the 19th Century but it is his grandfather who provides the connection to Culloden having witnessed the Battle of Culloden from the Hill of Cromarty when he was a boy of fourteen. His grandfather told of the day being drizzly and thick and when he climbed the hill he found many townsfolk already assembled. A little after noon a round white cloud rose from Culloden Moor and then a second beside it. He talks of hearing the rattle of smaller fire-arms mingled with the roar of artillery. Then, after what felt like an exceedingly short space of time, the clouds dissipated and the rattle and roar was replaced with the sharp patter of musketry. During his life Miller also spoke with at least two soldiers who fought at Culloden, one on the government side, the other the Jacobite. The first, a forester, accompanied the government army to Fort Augustus and spoke of the atrocities he saw; some of which still made his blood boil seventy years later. He talked of scores of cottages in flames and droves of cattle brought in from Highlanders lands. At one point he mentions there must have been about twenty thousand cattle and groups of drovers from Yorkshire and the south of Scotland would come in every day to share in the spoil and buy the cattle at greatly reduced prices. These accounts of the battle are incredibly special and show the impact the event had on the Highland that they were shared down the generations for years to come. Storied like these help give a personal insight to the battle and the events that took place here almost 270 years ago. From accounts of the battle we now move to something more modern and to the Highland Folk Museum at Newtonmore. Recently most people will probably have heard of this place in terms of Outlander as it featured in the TV series where they filmed the ladies ‘waulking the wool’. However, also on its grounds stands a Tin Tabernacle – ‘a temporary church’, in this case made from corrugated iron – that was previously situated on land that once formed part of Culloden Battlefield. 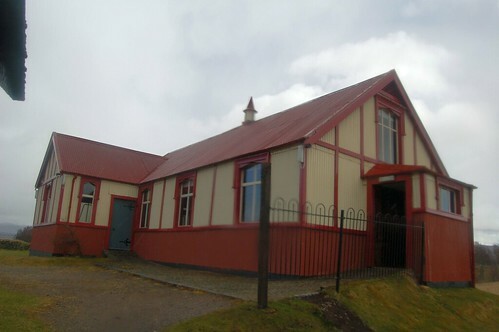 The building in question is Leanach Mission Church which was erected in 1907 to serve both the Church of Scotland and Free Church congregations. The church original sat in the crossroads beside the battlefield and was used by the local community. Originally supplied in kit form by Spiers of Glasgow, the church is listed as having cost £260 when it was first built. In the 1950s the services at Leanach Church were attended by 20 to 30 people, however, by the 1980s the church had become redundant and so was acquired by the Highland Folk Museum as the first of many ‘historical rural buildings’ to be re-erected on the museum’s site. The pulpit, organ and communion table have all been retained as original features in the wooden-clad interior of the church and it is great to have the original church kept safe as another point of history in the Culloden story. These are just two short examples of the story and importance of Culloden being shared and preserved but there are countless more throughout the world. Hopefully we will share some more stories but for now we hope you enjoyed this little insight and as always please like, follow, comment, tweet and share your own Culloden stories. Today we thought we’d explore a little bit about the history of Scottish Gaelic. 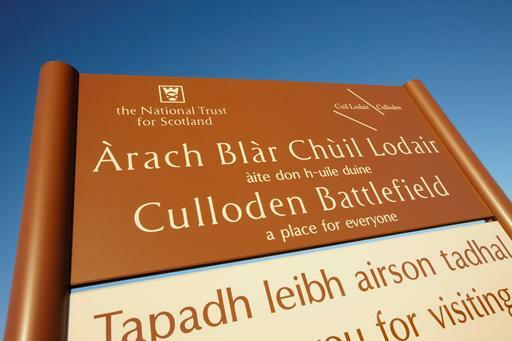 Here at Culloden, or Cùil Lodair, we get quite a few questions about the language as we are lucky enough to have dual language elements in our centre. So, we thought we’d use this opportunity to give a bit more information about the language. Gaelic is a Celtic language thought to originate from the north east corner of Ireland, which slowly spread its way across to the western areas of Scotland. Scottish Gaelic is a close relative of Welsh, Cornish and Breton, but shares a more intimate relationship with Irish and Manx Gaelic. These three Gaelic or Goidelic languages descend from a common ancestor, spoken in Ireland in the late first millennium BC and early first millennium AD. In Scotland, Gaelic became established as the main language and played a part in distinguishing the different cultures of the Highlands from the Lowlands of Scotland. The language has strong connections to the Highland clans, with laws and customs fully written and spoken in Gaelic. As the influence of the lowlands grew and swept north into the Highlands, so did the English language that we now speak today. Gaelic declined slowly over the centuries and there were several historical events which had an impact on the language, including the Act of Union with England in 1707 and the Highland Clearances following the Battle of Culloden. Gaelic however left its mark across the whole of Scotland and its influence can be seen in the names of Scottish places, mountains, on official buildings and on bilingual road signs on the west coast and islands. The Gaelic alphabet only contains 18 letters (the letters j, k, q, v, w, x, y, and z are not used) and looks a little different to the English one, with accented vowels and different letter sounds to get accustomed to. The roots of the language are closely connected to nature and the ancient Scottish landscape. There are more than 100 words for mountain and over 40 for bog. Indeed the letters themselves were named after plants and trees, for example, the letter ‘a’ is ailm, which translates to ‘elm’ in English. Today the Highlands and Islands of Scotland account for 55 percent of Scotland’s Gaelic speakers. It is most widely spoken in communities in the Outer Hebrides, as well as island communities on the Isle of Skye, and to a lesser extent, Argyll & The Isles. The Highlands is also known as Gáidhealtachd, the ‘land of the Gaels’, and proudly celebrates its Gaelic heritage. Interest in the language continues to grow, with various Gaelic language courses available, dedicated television and radio channels and cultural events taking place to celebrate contemporary Gaelic culture. Thanks to this the language is enjoying an increase in speakers and learners, with many young people choosing to learn the language of their ancestors, Inverness itself now hosts a Gaelic school and many schools offer Gaelic as an option to study. Due to a high number of Scottish emigrants in the 18th and early 19th centuries, Gaelic communities have also emerged across the world, most notably in Canada, in the Nova Scotia region, but also in New Zealand, Australia and other regions in North America. If you are interested in learning Gaelic be sure to check out http://learngaelic.net/ for more information and resources. Hopefully you’ve enjoyed this post and as always please like, share, tweet, follow, comment and be inspired to learn a little Gaelic. All the best K & D.
Last weekend on the 23rd August I joined our Property Manager Andrew on his attempt to cycle around 10 National Trust properties in one day. Suffice to say I was not cycling, instead I was in the support car and over the course of ten hours we managed to cover nine properties and over 155 miles! Once the sun came up, a mere five hours into the ride, the day was gorgeous from the car with brilliant sunshine but on the bike the relentless winds and afternoon heat were a little more challenging. Now, I can’t comment on the ride because firstly I didn’t actually do it and secondly I am not a cyclist and therefore would talk about nothing remotely technical or interesting to any cyclists. So, instead I decided this week to write a blog about the places we visited. The great thing about the National Trust for Scotland is the variety of places it looks after. Some people think the NTS is all about castles, but this is totally wrong. Our trip took us to a garden, two mountain areas, a cottage, one countryside estate, an island, a towering gorge, a battlefield and yes a castle, but one is allowed. We started at Kintail which is spectacular. It hosts the Five Sisters – a mountain ridge incorporating three Munros – and the Falls of Glomach, Britain’s second-highest waterfall, as well as lochs, glens and coastline. It also has two Scheduled Ancient Monuments: the site of the 1719 Battle of Glen Shiel, and Cill Fhearchair, a 2,000-year-old standing stone and burial ground. All very impressive, unfortunately, when we arrived it was midnight and pitch black so all we saw was a vague outline of the mountains around us. We did however take photos with the bikes with the flash on and laughed about the reaction we would get if anyone came across our strange group and at how crazy we all must be. 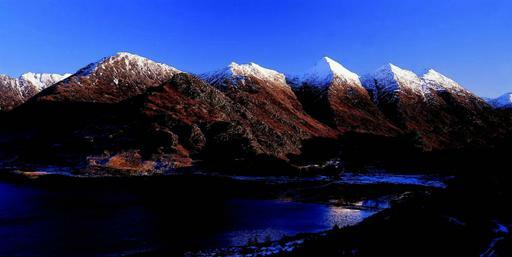 How the Five Sisters at Kintail look in daylight. Just down the road from Kintail we headed through Blamacara Estate which is a traditional Highland crofting estate and covers some 2,550 hectares. There are 84 registered crofts on the estate, using traditional crofting agricultural methods such as rotational cropping and cattle rearing which are directly supported by the Trust through its Traditional Croft Management Scheme. The towns of Drumbuie, Duirinish and Plockton are exceptional examples of traditional croft management and if you get the chance you should definitely stop and talk a wadner along some of the woodland walks. Whilst we didn’t stop we certainly enjoyed the drive. With the cool night air speeding us along and very few cars to get in the way we were able to enjoy the winding roads without the normal worry of encountering the dreaded motorhome coming the other way. 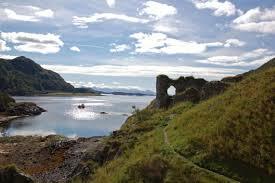 As I said we did hit one castle and this was Strome Castle. I have to admit before this ride I had never been to Strome, terrible I know, but I am really glad I got the chance. Its one of the NTS’s little gems and sits on a little promentary jutting out into Loch Carron making it a beautiful little viewpoint. From here we also visited Sheildaig to cycle past Sheilaig Island. Another little gem the island is almost entirely covered in Scots pine, thought to have been planted over 100 years ago to provide poles for drying the nets of local fishermen. 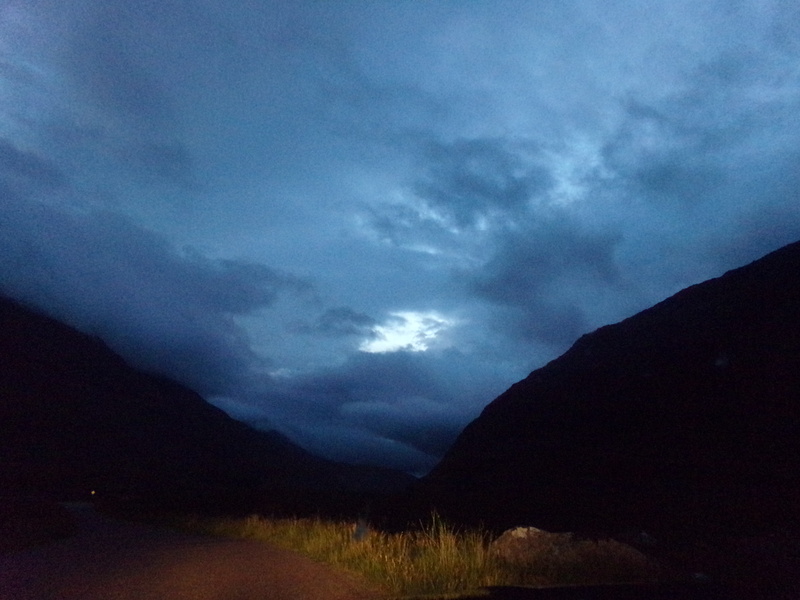 Finally as the sun began to rise we hit Torridon. This place is gorgeous and offers some of Scotlands finest mountain scenery. Five of the Trust’s 46 munros can be found at Torridon and the site is a magnet for walkers. At this point I feel I should apologise for using so many adjectives but we are really lucky in the Highlands to have adjective worthy scenery everywhere so whilst it may sound like I’m just saying everything is amazing for the sake of it, I’m not, it truly is a beautiful landscape with every corner giving you new and exciting scenery. Driving through as the sun rose was a special way to see the area, even though it was still a bit cloudy, and I think we were all pleased to have the daylight to guide us on towards Inverewe as the winds began to pick up. Inverewe Gardens is a unique place. Despite the northerly latitude the area is full of colourful and exotic plants. Thanks to the warm currents of the Gulf Stream and the foresight of Osgood Mackenzie, who planted over 100 acres of woodland to shelter the area the garden can grow species of plants from across the world. This was our first major stop of the day so that we could stretch our legs and have some breakfast, which felt very strange considering we had already been awake for hours. Also fun was providing a slip stream for Andrew. I like to think we were really important and also very good at not running Andrew over, though that’s probably because it wasn’t me driving. From Inverewe it was a big push to Corrieshalloch Gorge. With the traffic picking up and the wind against us all the way it was a struggle to stick with Andrew but what was great was all the encouragement we got along the way. Everyone we spoke to was keen to hear about our crazy challenge and were wishing us luck in reaching Culloden to finish the day. We didn’t actually stop at Corrieshalloch, mainly because from the road you don’t get to see all that much. 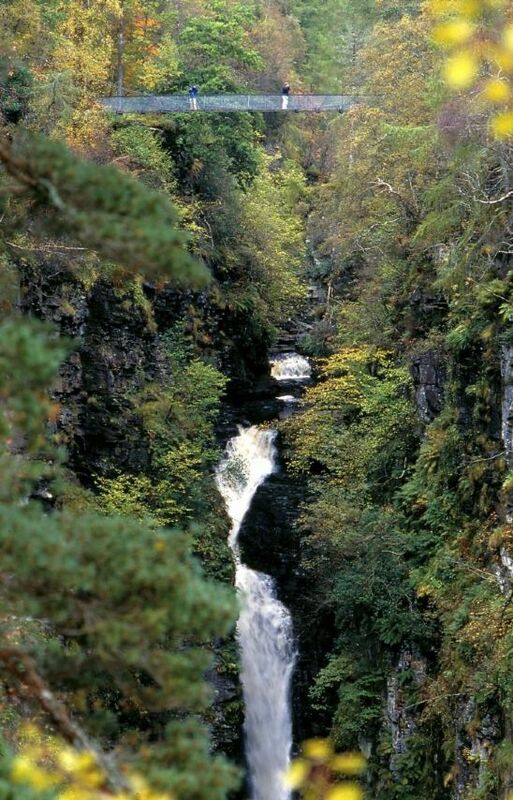 Instead you have to walk out, preferably onto the suspension bridge, to get a true view of the largest waterfall, the Falls of Measach, as they drop 46m drop the slot gorge. 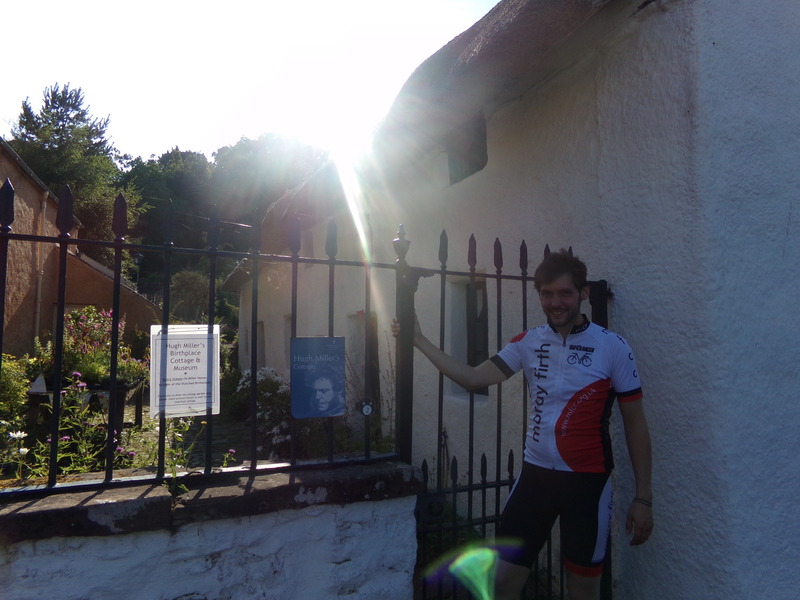 Our last stop before Culloden was Hugh Millers Birthplace on the Black Isle. 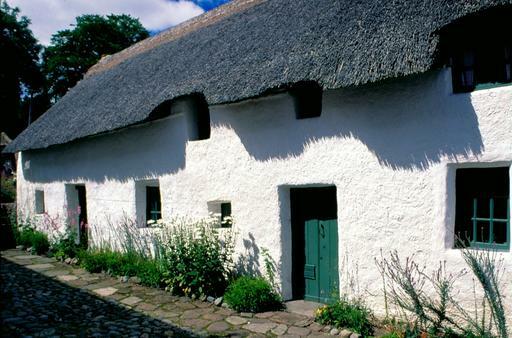 This small cottage tucked into the streets of Cromarty celebrates the life of Hugh Miller – a 19th century geologist, writer and social commentator. Here the sun picked up which made for glorious views across the isle and made you wish for an ice cream to cool down, even for those of us not cycling. I wish I could say we then cycled to Culloden but with the wind still pushing us backwards and the heat reaching 31 degrees we had to admit defeat. 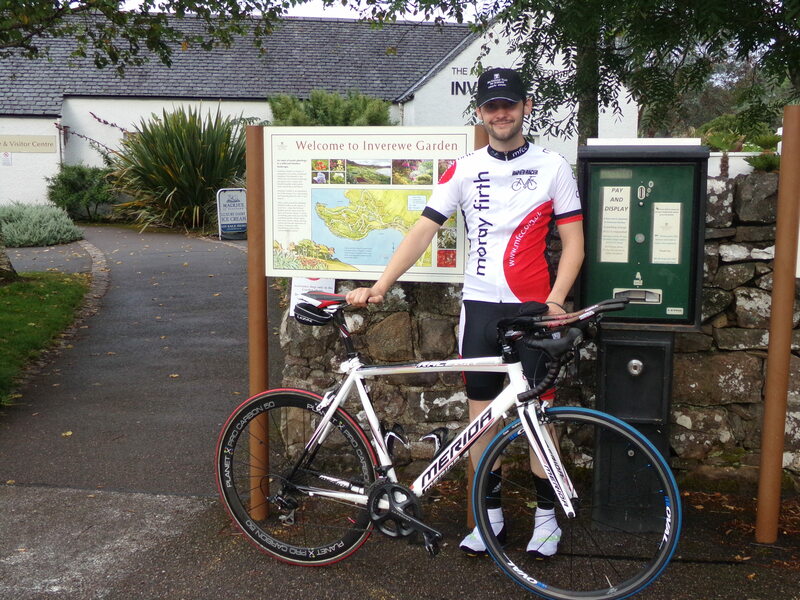 It was five o’clock and in ten hours Andrew had cycled over 155 miles. Safe to say it was a massive achievement and even if it wasn’t quite what we had aimed for I think everyone was amazed we’d managed to get as far as we had in one day. So, since we had to finish at Culloden we all got in the car and drove the last little bit to be met by our colleagues who were impressed we were still awake and forming coherent sentences. Overall the day was great fun and utterly exhausting! Whilst a great effort by Andrew that served to raise money for all the properties we visited the day also highlighted the amazing work the National Trust for Scotland does. I think sometimes people forget that it is a charity and as such only runs because of the amazing generosity of our visitors. As the third largest land owner in Scotland the Trust has a lot of ground to care for but it’s is worth it when you get to see the spectacular scenery that they protect.